A team of researchers from John Hopkins University has achieved a major step towards one of the most desired goals in cancer research: a blood test for early tumour detection. 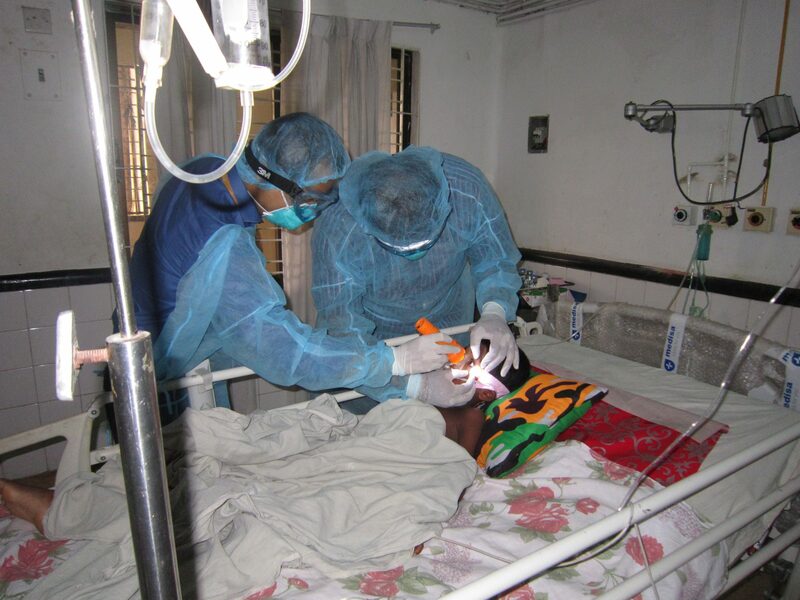 Early detection, key to reducing cancer-derived mortality, allows localised cancers to be surgically excised before they metastasise. 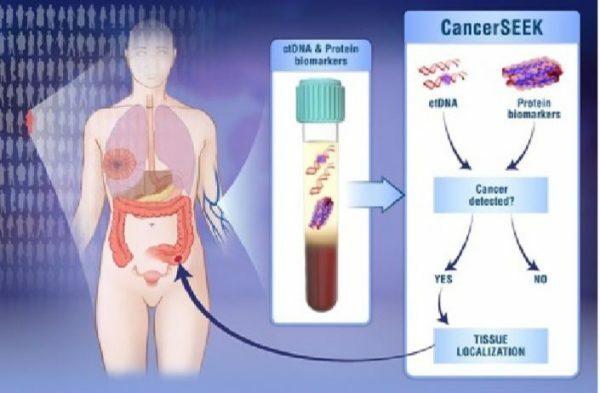 CancerSEEK, described as a ‘liquid biopsy’, tests and examines mutations in cell-free DNA and proteins circulating in the bloodstream. Over 1,000 samples from cancer patients who had shown symptoms of cancer were studied in order to determine whether this test would accurately work. The principle that supports this multi-analyte blood test is that genetic mutations drive cancer cell growth and some of the mutated DNA from dying cells is released into the blood. Several groups, including the one from Johns Hopkins, have demonstrated that ‘liquid biopsies’ of blood-borne tumour DNA can reveal whether that individual’s cancer responds to a speciﬁc drug. 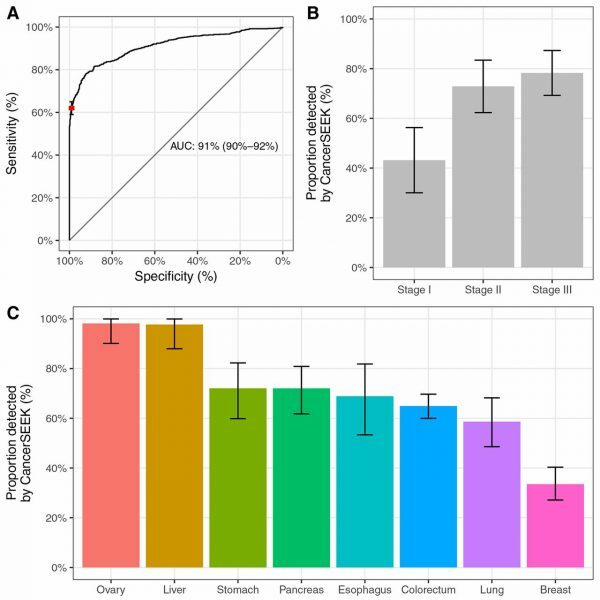 CancerSEEK was used to detect the presence of eight common solid tumour types – ovary, liver, stomach, pancreas, oesophagus, colorectal, lung and breast – which account for roughly 60% of the estimated cancer deaths in the U.S.
For certain tumours (ovary and liver), the test was up to 98% accurate (across the eight cancer types – median 70%, sensitivity ranged from 69-98%, speciﬁcity >99%) (see Figure 1), placing CancerSEEK among the most reliable performances so far for a universal cancer blood test. Perhaps even more relevant is that it allows to narrow down the localisation of the cancer in 83% of patients, a previously unachieved feat. Dr. Joshua D. Cohen, a researcher from the group, stated that ‘the test could be available to patients in the next few years’. 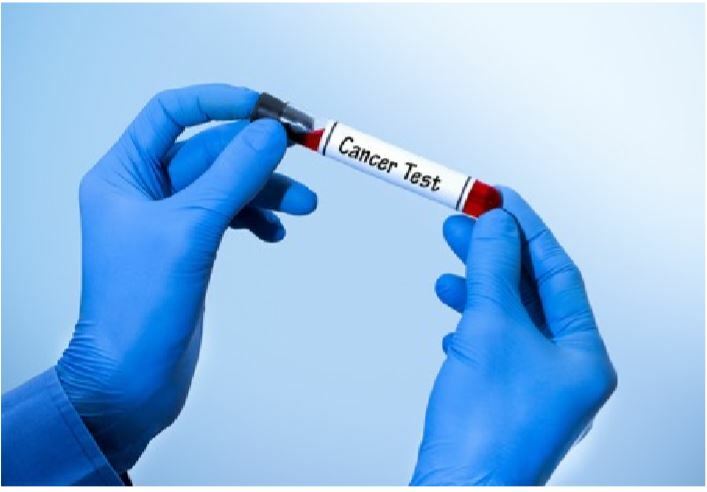 The team estimates that the cost of the test would be less than US$500; comparable or even lower than other screening tests for single cancers. The aim is to develop a tool that screens people routinely and detects tumours even before any symptoms manifest, a stage in which patients have the highest probabilities for survival. The group, led by Nickolas Papadopoulos and Bert Vogelstein, has already begun a prospective study to deﬁne if the test detects tumours in women who are apparently cancer-free.